The Sabres begin the season in four days, and some question marks still remain as to who will be part of that opening night roster against Ottawa. The organization has made quite a few cuts over recent days that have answered some questions, such as sending Cal O’Reilly down to Rochester. There’s still a handful of decisions to be made in the next 24 hours, or so, with the roster currently sitting at 28 players and only enough room for 23. Here’s how I see the Sabres’ roster looking to start the year. Locks: Robin Lehner and Chad Johnson. No surprise here, as this is the easiest portion of the roster to forecast. Lehner is the obvious starter, with the organization hoping Chad Johnson plays like he did two years ago rather than during his short stint on Long Island last year. Down to Rochester: Linus Ullmark. Ullmark is still rehabbing from his double hip surgery in the spring, but has been in Buffalo working out. When Ullmark is healthy, he should see his first pro action in North America down the thruway with the Amerks. Locks: Zach Bogosian, Rasmus Ristolainen, Carlo Colaiacovo, Cody Franson, Josh Gorges, Mike Weber. This doesn’t mean these six are the six that will be in the lineup Thursday night, but they’ll definitely be on the roster. Rasmus Ristolainen has recovered from his upper body injury, and while Josh Gorges and Zach Bogosian are a little banged up, it doesn’t look like it will require either player to open the year on the IR. 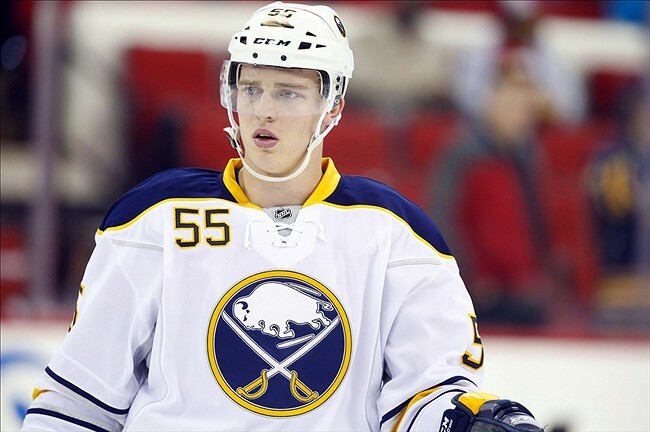 Work to do: Mark Pysyk, Matt Donovan. Due to injuries, I think the opening night roster ends up with eight defensemen rather than seven. If that’s the case both Donovan and Pysyk will be in Buffalo come Thursday. Donovan has had a fairly solid camp, particularly in the way he’s been able to get shots through from the point. Pysyk was pretty much an NHL defenseman last year that was buried in the AHL in an effort to nab one of Jack Eichel or Connor McDavid in the draft. With that goal achieved the only thing standing in the way of regular ice time at the NHL level is his health; he looks to have gotten over the scare he had last spring and should eventually be a regular on the blue line. Perhaps the biggest question regarding Pysyk’s status isn’t if he makes the roster, but where on the roster he winds up. Is he a top-four player now? Or does he need to grow into that role as the season begins? Down to Rochester (or juniors): Bobby Sanguinetti, Brendan Guhle, Jake McCabe. McCabe has seen his preseason interrupted by injury, and it will likely mean the Wisconsin product returns to Rochester. 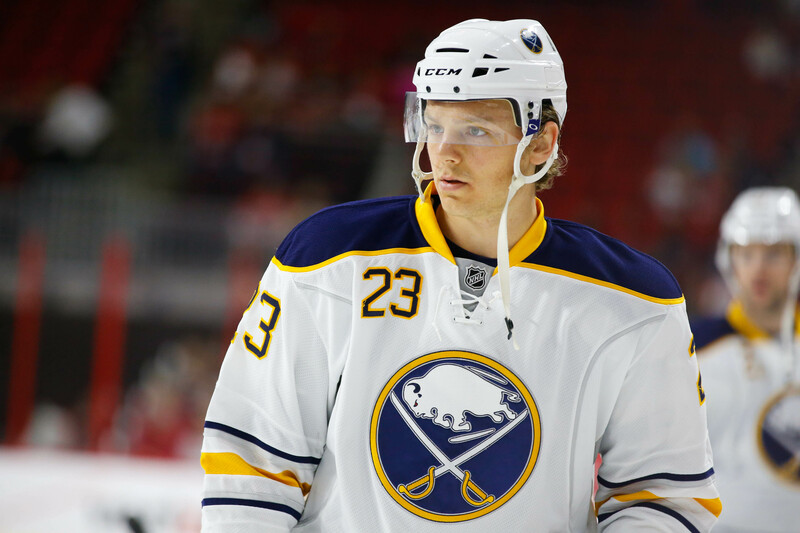 Guhle was perhaps the most impressive prospect not named Eichel throughout the rookie camp and training camp. Guhle was widely seen as a player who had raw ability but was likely a year or two away from getting a professional deal, but his performance since the draft prompted Tim Murray to ink him to his entry level deal this summer. He demonstrated he’s ahead of the schedule many had for him, but another year in Prince Albert will do him well. Had the injuries to Buffalo’s most established defensemen left larger holes to start the season, I think Guhle would have likely seen nine games before his contract kicked in. That’s probably still in the cards, but returning to the WHL will be the best for his development. Bobby Sanguinetti demonstrated that he’s capable of filling in when needed, but should be looked upon to provide some leadership in Rochester. He was mentioned by John Vogl as being part of the walking wounded, so we’ll see if he starts the year on the IR at the NHL level before being sent down. Locks: Jack Eichel, Evander Kane, Ryan O’Reilly, Tyler Ennis, Zemgus Girgensons, Brian Gionta, Matt Moulson, Nic Deslauriers, Marcus Foligno, David Legwand, Jamie McGinn. These names are all but set in stone after Cal O’Reilly’s demotion over the weekend. Dan Bylsma still has some work to do in order to shake out his lines, but the forward group is all but set. 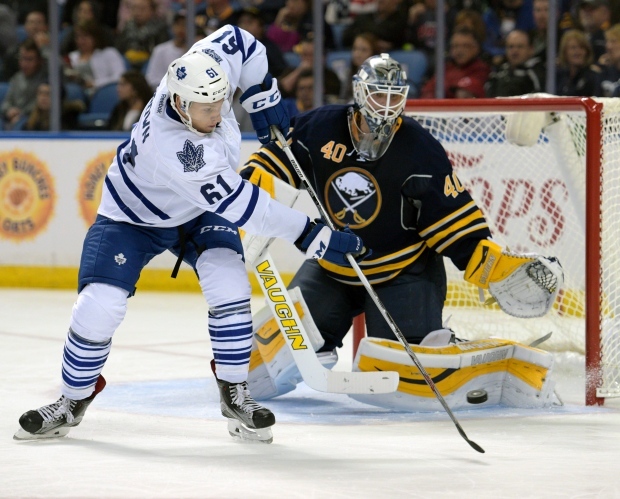 Work to do: Johan Larsson, Sam Reinhart. I think both players deserve to be in Buffalo, but they aren’t guarantees. Reinhart has done everything asked of him this offseason, and will likely slot in as a third line winger at the beginning of the year. Johan Larsson showed the ability to perform in the NHL at the end of last year when he centered the Sabres’ top line due to injuries, but it looks like Larsson may be making another trip down the 90 if the Sabres opt to keep 8 defensemen. While I think he’ll play a role in Buffalo this year, it likely won’t start this week. IR: Cody McCormick. McCormick is still battling blood clot issues that began last year and didn’t pass his physical to begin training camp. Could you explain why, for example, Guhle will go to the WHL as opposed to the AHL? I guess its based on contracts/options? Guhle is ineligible for the AHL much like Zadorov and Girgorenko were before him. The NHL/CHL agreement prevents players under the age of 20 from going to the AHL. So if they’re under contract they must either play in the NHL or for their junior club. His contract wouldn’t officially start if he want back to Junior, however.